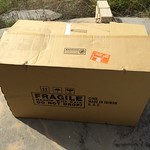 In this post I mentioned that I would show how the GSO RC12-A was commissioned. Here’s the process. It seems to have worked well. 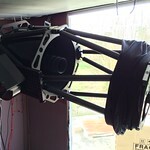 Next steps are to collimate the scope, then test it with some T-Point modeling runs of the sky. 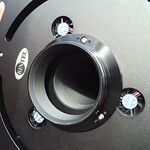 Here’s some information on collimation using a Tak Collimating Scope. Step 1: Admire the box. Right, frippery over with. 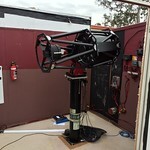 I know that this scope has some 'high maintenance needs' because of the nature of the mirrors. 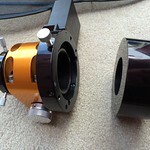 It's a large aperture mirror system, so needs careful attention to collimation. To achieve that, I have a Takahashi Collimation scope from OPT. 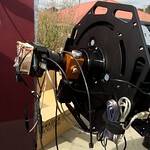 An open tube scope can suffer from light bleeding in to the scope and because the mirrors are exposed, more dust and moisture than Schmidt-Cassegrains (and other closed system telescopes). 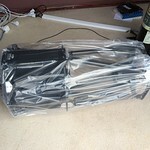 Telegizmo make a shroud to cover the open part of the scope and a dust cover for storage. Before I opened up the scope, I didn't know that GSO provide dust covers anyway. Still, this one will be useful nonetheless. 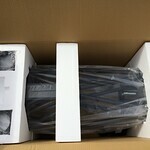 Both came from OPT. 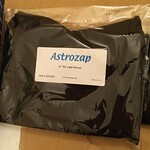 Here's a shot of what the scope looks like all shrouded and covered. 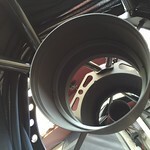 The rear cell of the GSO 12" RCA is 117mm wide with a thread pitch of 1mm, in other words it's 117x1. Not standard! Luckily, the good people at Moonlite make an adapter that it perfectly suited to their equipment and this rear cell thread. 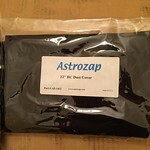 In America and Europe, this scope is marketed as an "Astro Tech" or "TPO" branded scope - so any adapter that fits an "Astro Tech" or "TPO" scope will fit this one also. 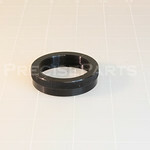 Here is the Moonlite focuser adapter for the rear cell of the GSO 12" RCA. Here you can see the thread pitch. Here you can see the grease that comes with the adapter. 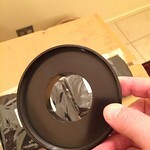 This is useful because it helps seal the top of the Moonlite focuser on the Moonlite base plate. You'll more about this below, hopefully it makes more sense there. 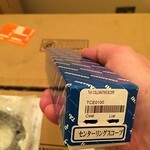 Lastly, making it's way to me is an adapter from Precise Parts in the US to allow the Takahashi Collimating scope (above) connect to a T-Threaded 2" nosepiece adapter. That will let me collimate the GSO 12" RCA precisely. With the accessories introduction out of the way, 1st thing I did was open up the box and take a look. This next bit is not well shot because, well, it needs more than two hands. Thanks to Alison for the other pair that helped. 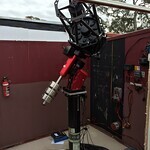 I had to lift the scope into the saddle on top of the mount, then tighten the mount saddle, test the balance, then move it backwards and forwards, test it again, then move the counterbalance weights until both DEC and RA axis were finely balanced. Here's a shot of one axis being balanced. 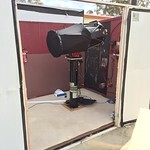 Having done an initial balance, time to connect the imaging train. 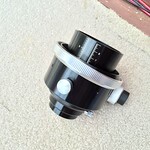 GSO give you a nice 3" crayford focuser. 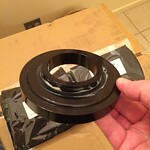 I've read no good things about this focuser and I think I could tell why when I removed it. it felt lightweight, thin around the edges and when removing it from the rear cell, the locking mechanisms moved despite it being tightly locked in place. So, the decision to replace this with a Moonlite was a good one I think. Here's the process I used. 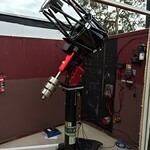 Here's the scope with the focuser with which it came. The locking ring is the grey thing closest to the scope. Everything else is decoration it seems. Turn the locking ring counter clockwise to remove it, which was the work of a minute. Here is what the rear cell looks like with the crayford focuser removed. 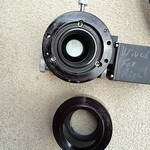 Now to replace the focuser with the Moonlite. 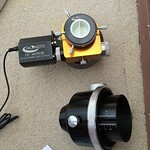 Moonlite focusers come in two parts, a flange and the focuser itself. 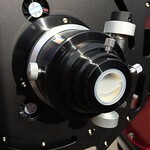 Here you can see the flange removed from the focuser. 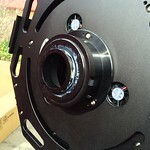 The flange is held in place with grub screws and a clamping screw (up the top). 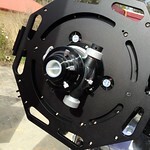 This means you can loosen the grub screws and move the focuser around with ease. Hence the grease you saw on the flange earlier. 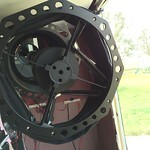 So here you see the flange, and next to it you can see the Moonlite attached. Now I can re-attach the imaging train. 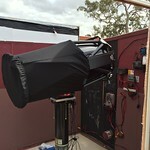 Yes, I know I will need to remove it to collimate but for now, I add the imaging train and re-balance the scope. That done, here is an image of the scope with the dust caps removed. 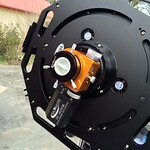 Here is an image of the secondary mirror. 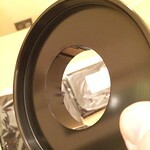 And here you can see the center spot in the secondary mirror that will aid in collimation later. I haven't seen a center spot in the primary, doesn't mean that there needs to be one, but I'll see how that goes another time. Here the shroud is being placed on the scope.